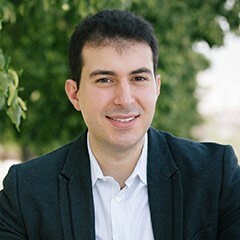 Composer and alumnus Saad Haddad (BM ’14, composition) has received the Distinguished Composer of the Year Award from the California Association of Professional Music Teachers (CAPMT) and has been has commissioned by the organization to compose a new work for flute, viola and harp. The work will be premiered at the CAPMT State Conference in Long Beach this October. Currently based in New York City, Haddad recently premiered a work with the American Composers Orchestra at Carnegie Hall and had compositions performed by the Milwaukee and Columbus Symphonies, among many ensembles. At USC Thornton, he studied with Donald Crockett, Stephen Hartke, Frank Ticheli, and Bruce Broughton.